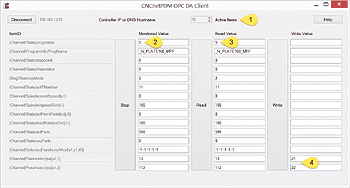 CNCnetPDM OPC DA for Siemens Sinumerik 840D controllers enables you to acquire and monitor machine-, process- and quality-data from your machines from a remote PC. It also allows to write and change parameter values on these devices. This document describes setup and test of data acquisition and writing of parameter values from/to Sinumerik controllers that use OPC Classic which is most likely the case if your controller has a Microsoft Windows OS and does NOT run Sinumerik Operate >= Version 4.5. Our OPC Classic Device Driver for Sinumerik 840D controllers enables constant monitoring of your machines with a Windows Background Service. Writing and changing of parameters is also included. Start up the controller in service mode without HMI. It is recommended that you turn off simple sharing: Click Start->Run type in eplorer.exe click on Tools->Folder Options. In tab View uncheck ‘Use simple file sharing (Recommended)’. Click OK. If you have the firewall enabled at the controller proceed as follows: The most simple way to avoid communication problems is to turn off the firewall. Click on Start->Settings->Control Panel->Windows Firewall. Click on Off (not recommended) followed by OK. You’re done. If you want to keep the firewall switched on you have to adjust some settings. * Depending on the setup of your controller these files may be stored at a different location. Restart the controller in normal mode to enable HMI again. Important: In case your PC runs an Operating System > XP, e.g. Windows 7 AND the controller PC runs Operating System Windows NT 4.0 you mandatorily have to set 'Default Authentication Level' in tab 'Default Properties' to 'None' otherwise you just get an 'Access denied' output from the test programs and the device driver! You also have to reboot your PC for these changes to take effect. For successful communication between PC and controller it is necessary that the querying computer is able to access the controller and its Operating System via the network with proper credentials! If you have installed CNCnetPDM on your PC with a license other than a ‘free license’ and run this program from the folder where CNCnetPDM is installed you can modify all OPC Items. Otherwise you can monitor, read and write all predefined OPC items. Please see licensing for details or contact us if you have any questions. Extract all files from Sinumerik_840D_OPC_DA.zip to a folder on your PC. In case you use a firewall at your PC or your company network please make sure that there is an exception for TCP Port 135. As the ports for OPC communication are dynamically assigned you also have to add an exception for program CNCnetPDM.OpcDA.SimpleClient.exe. You can use our tool Device Port Scanner to check if your controller is reachable via port 135. Note: The program requires .NET Framework 2 components to be installed on your PC. The program enables you to connect to your controller via OPC DA (Classic), monitor, read and write items. Right click CNCnetPDM.OpcDA.SimpleClient.exe with the shift key pressed and select ‘Run as different user’. Enter user name ‘auduser’ and its password. In CNCnetPDM.OpcDA.SimpleClient.exe enter the DNS Hostname or IP Address of your controller into the textbox right to [Connect] (1). Click [Connect] you now should be connected to the OPC DA server on your controller. Initially one item is queried, by changing ‘Active Items’ (1) to a different value you can activate up to 15 items. The 15 predefined values under ‘ItemID’ are known to work well on most controllers. With a licensed version you can change them according to your requirements. The last two items are 2 writable R Parameters (user variables) that are visible at the controller: [MENU SELECT] -> [Tools Zerooffs] -> [R Variable]. If you click on button Read (3) the values of all active items are queried from the controller and shown in the dialog. For the last two variables R1 and R2 you see their current values as set at the controller. By entering different values for these two writable items and clicking on [Write] (4) you can change their values at the controller. Clicking on [Monitor] (2) adds all active variables to a subscription and shows their current value. Note: In the zip archive you can also find file ‘Querieable_Values.txt’ that contains a list with 1630 variables that can be queried from Sinumerik 840D controllers. In case of errors the program outputs an error log file that can be found in the directory where the program is located. This file contains detailed information about any errors. If you see a popup window with CoCreateInstanceEx: Access is denied make sure that you run the program as user ‘auduser’. If you see a popup window with CoCreateInstanceEx: The RPC server is unavailable check that the controller is running, you typed in the correct IP Address and you configured your firewall correctly. If you see values like Exception from HRESULT: 0x… in one of the output fields when reading or monitoring check that you typed in the item id correctly. In case of writing check that the item is writable e.g. a r-parameter and you didn’t type in an improper format e.g. alphanumeric instead of numeric. 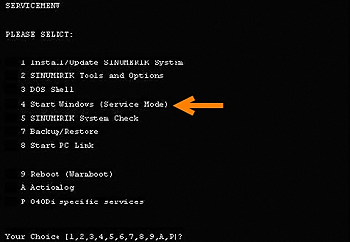 When the prompt 'Please select the operating system to start:' is displayed, press the KEY until the line below SINUMERIK is highlighted in white. Confirm the selection by pressing the INPUT KEY. Select the menu option: 4 Start Windows (Service Mode). This password authorizes you to make extensive changes to the control. The password must be entered in upper case letters. After the PCU has booted in service mode you can configure MS Windows components.